Do you know what people want the most in a SHA? “…a nice tight fit.” Collectors are always complaining about sloppy SHA’s. They hate when they are all blown out; totally overused. I’ve never complained about any SHA. If I’m lucky enough to closely inspect a SHA, then I’m not worried about fit. Maybe it’s something about me? Maybe anytime I’m around it is guaranteed to be a tight fit. – I don’t care about this one, but a $0.99 starting bid deserves a nod. – “There are a total of 6 or 7 different colors represented.” Do they really not know? That makes me feel sad. – “Some rare A figures, some common. HUGE mix.” This is exactly how Donald Trump would talk about his M.U.S.C.L.E. listing. – If you need to sell a Flesh figure for $6.95, then you’ve made some very poor life choices. 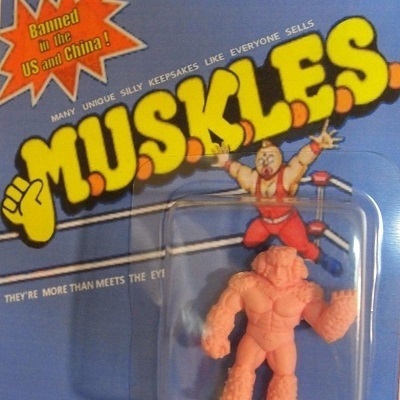 My very first thought was MUSKLES, because they were just a little different than M.U.S.C.L.E. figures. I immediately felt ashamed for having such a stupid idea. I was ashamed because it wasn’t clever or even a little kitschy. It was the easiest, laziest first thought. It wasn’t even good enough to be cliché because it was so dumb. I was relieved I never shared it with the world. This is like watching my own, shameful, private nightmare coming to life. – “20 years in storage.” Obviously these were stored in a whore’s stomach for 20 years. Obviously. 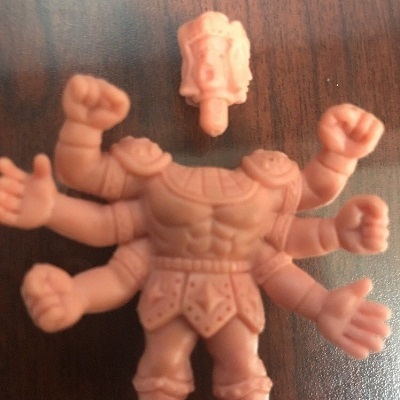 – What if terrible M.U.S.C.L.E. prices are making Kim Jong-un crazy too? – Too much effort was put into these pictures; with not enough results. – “All items are sold as is and all sales are final.” They’re pushing it harder than before. I’m buying these for work. It’s going to be a magical tool to help stupid people that don’t know how to behave appropriately. This entry was posted on Friday, August 25th, 2017 and is filed under UofM News. You can follow any responses to this entry through RSS 2.0. You can skip to the end and leave a response. Pinging is currently not allowed.